Militants flexed their muscles on Independence Day by attacking an Army camp on Wednesday situated at Theigothang Village near the Indo-Myanmar border in Churachandpur district of Manipur. 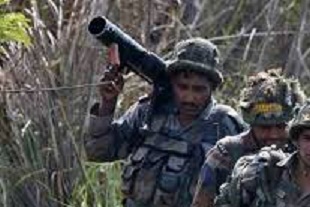 A report published in the The Indian Express stated that according to official sources, B-company of 6 Sikh Light Infantry came under attack early morning at around 5 am. The armed militants reportedly pounded the base with several rounds of bombing followed by a volley of machine guns firing. The report further stated that the Army troops retaliated effectively using mortars, machine guns resulting in the withdrawal of the militants, said the sources. While the gunfight lasted for several minutes, no casualties were reported in the firefight. The sources also informed that the militant launched the attack after having crossed the international border. A search operation is said to be in progress till the time of filing of this report. The attack comes in the wake of the boycott call of India’s Independence Day by several militant groups operating in the north-eastern States across the region. Despite the boycott call, the 72nd Independence Day was celebrated across Manipur. The State-level celebration was held at the 1st Battalion Manipur Rifles ground with the Manipur Chief Minister N Biren Singh as the chief guest. Singh urged the people of the State to join hands in safeguarding the oneness and integrity of the State and the country.